White PCB and plates. EasyEDA recently lowered their prices and the price to have different color soldermask. 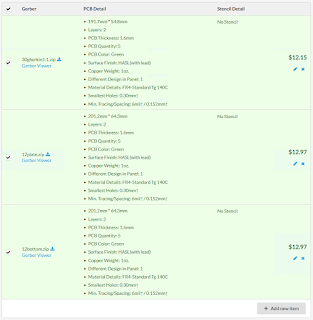 It is now cheaper to order your own sets of PCBs/plates. The Invyr Panda switches have very little wobble/twist. It is very obvious with the Semiotic keycap legends if your switches are not perfectly straight. 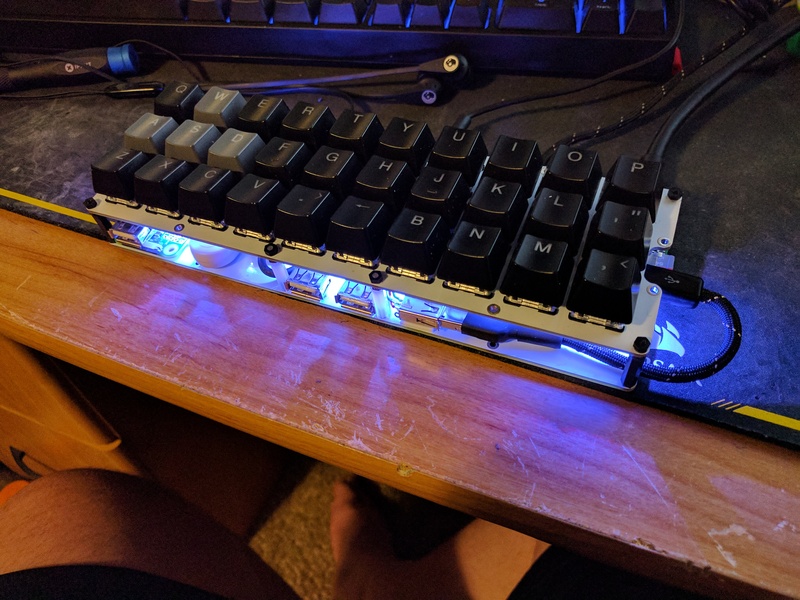 I tried them on some Outemu Blue switches and it looked horrible with all the keys crooked. The keycaps look very straight and aligned on the Panda switches. There are only 10 WS2812B LEDs instead of the 22 I used previously. The WS2812B LEDs are on rigid PCB strips, not the normal flexible adhesive strips. They are otherwise the same spacing as the 30/meter strips. There are also blue 2x3x4 LEDs inside the switches. They shine up through the slot in the switch tops. It is now $58.09 for 5 sets of Gherkin PCBs with airmail shipping. $38.09 (down from $55.80) for the boards and $20 shipping. That's $11.62 per set, shipped. The upcharge for different color soldermask is also lower. $8.21 instead of $10. I don't think this a special. I don't see any announcement on their site, they did recently change their look though. How to order a PCB from gerber files. Found a piece of aluminum plate just the right size for the Gherkin on eBay. First project with my Vanda-Lay drill press. Drilled the holes with a 5/64" bit. Just the right size for 2mm screws (1.984mm). Drilled out the bottom of the holes to 1/8" to hide the screw heads. The hex head nylon screws I had were slightly larger than 1/8" so I pounded them in with a mallet. They are very snug. The aluminum pieces I bought were saw cut, they had very precise square edges. Sanded the edges and surface down with 220grit and then a scotchbrite pad to give a nice even finish. Total weight with keycaps is 365grams. This is a custom keyboard PCB that uses 12 analog channels on a Teensy LC. 4 switches are attached to each channel. Each switch when pressed connects to ground through a resistor. Each of the 4 switches has a different value resistor. Through parallel resistance the voltage divider produces a different voltage for each of the 16 possible combinations of the 4 keys being pressed. This voltage is sampled by the Teensy LC input pin and converted to a decimal value. These values are compared to an array and translated into keypresses. The schematic shows the 12 channels and the resistors in the parallel resistor/voltage dividers. A Pro Micro was used to control the LEDs in the same way that the GNAP does. 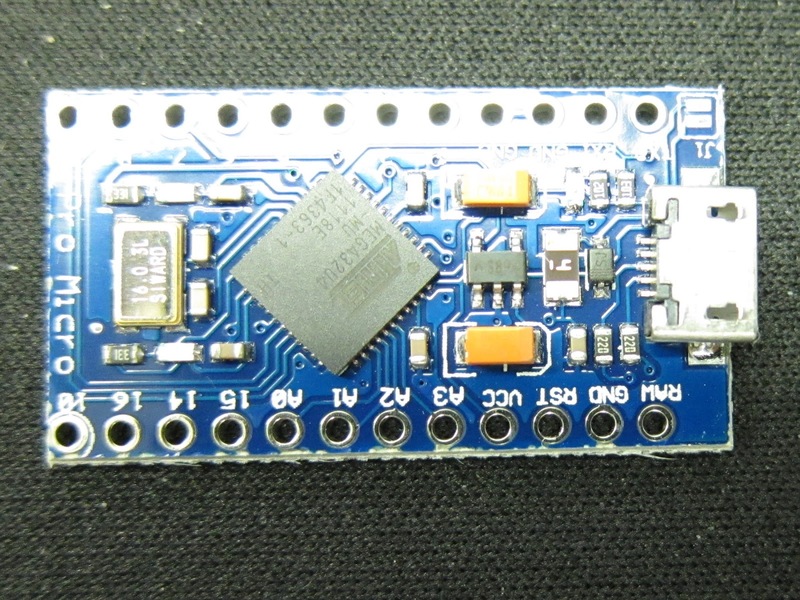 An Arduino sketch was used to sample the analog inputs and output to serial monitor. The data was compiled and the values corresponding to the 16 different switch combinations identified. In the chart you can see the distribution of the 16 values. As more keys are pressed there is less separation of the values. 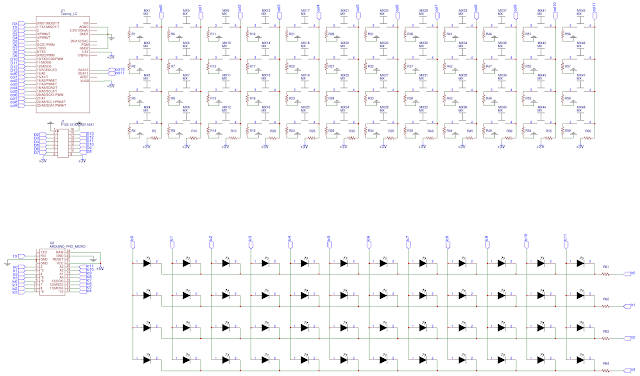 These are the 16 different analogread ranges for each of the 16 switch combinations. Resistor values must be selected so that the ranges never overlap. The resistor values used were 1k, 2k, 3.9k, 8.1k. The pullup resistor is also 3.9k. Mathematically they should produce distinct voltages when combined in parallel in any combination in a voltage divider. 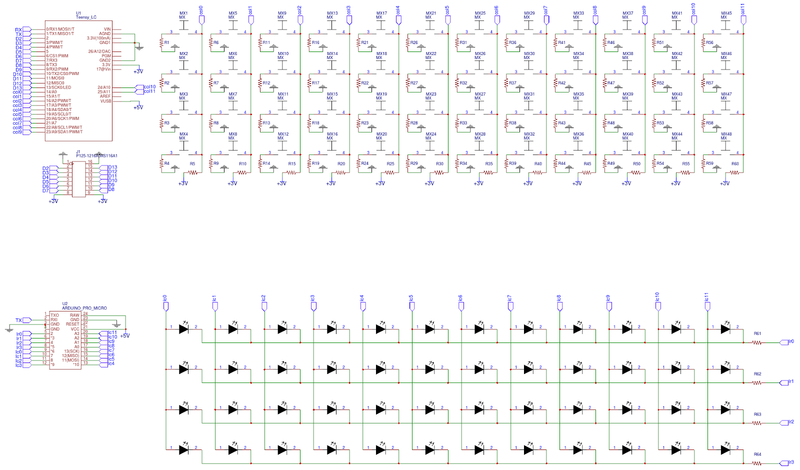 The matrix works, and my prototype can detect all 48 switches being pressed in any pattern. Currently there is no keyboard code, it is just a large board of switches that light up the corresponding LED when pressed. There is a problem in that resistors are temperature sensitive, their resistance changes with temperature. The ones I used are metal film 1% tolerance with a 50ppm/C temperature coefficient. These were relatively inexpensive at 5 cents a piece. The problem is that there is sufficient drift with temperature that the readings on the lower end start to drift with temperature extremes. There are better resistors, 0.1% 15ppm/C, but they cost 7 times as much. Instead of $3 of resistors it would be $21. Other possible solutions are to use a temperature sensor, switch to a Teensy 3.2, or add a better power supply. With a temperature sensor the readings can be adjusted to compensate for thermal drift. The Teensy 3.2 has an ADC with 1 more bit of resolution, which may or may not help. A better more stable power supply may remove some of the jitter in the readings. It is currently using the 3v regulator built into the Teensy LC. I probably won't pursue this any further. Since I can't get 100% accurate output without modifications which may not help and it is cheaper and more reliable to use a conventional matrix. This uses 12 pins at 4 switches per pin for a total of 48 switches. A conventional matrix for the same number of switches can be made of a 8x6 grid, only 2 more pins. Keycaps are the X-Keys relegendable ones. I glued them shut since the tops pop off with the slightest pressure from the side. Probably fine when used with the X-Keys boards since they have very high bezels. A second PCB was used as the bottom. You can see the Teensy LC and the Pro Micro between the two PCBs. EasyEDA now redirects you to order from JLCPCB. The process is not much different. The zip file contains multiple files each for a different layer of the PCB front/back. Do not edit these files. They have been tested as they are. Go to EasyEDA.com and click "PCB Order"
Set the quantity, 5 piece minimum per board. PCB should be 1.6mm. With only soldermask (no copper/silkscreen) the PCB will be 1.52mm thick.This matters if you are making a PCB switch plate for MX style switches. Select airmail or express (usually DHL). 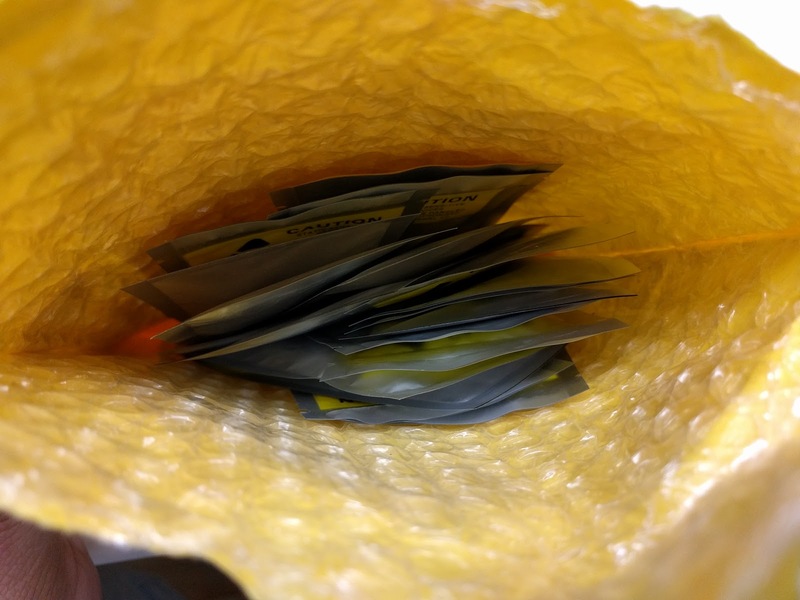 Airmail is only an option for lighter orders. The video below goes through all these steps. 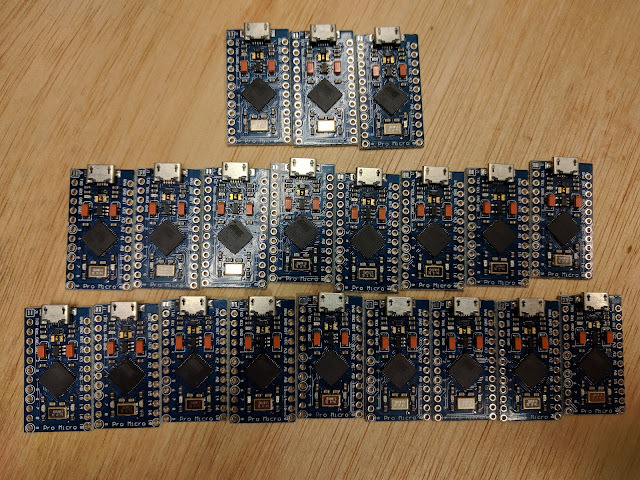 The price of each individual board goes down dramatically with quantity. 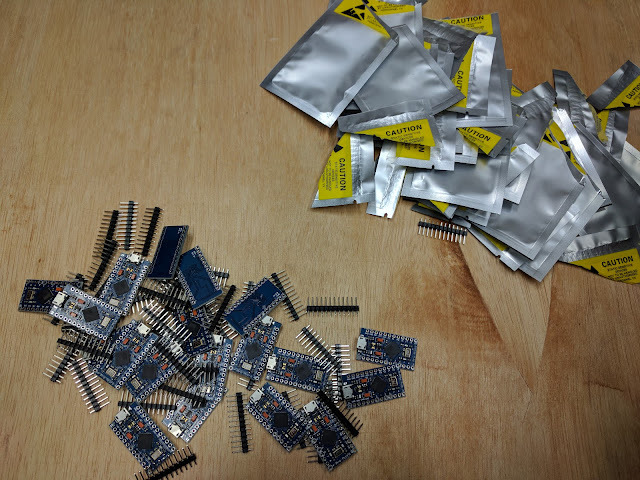 The cost of shipping also goes up dramatically, PCB's are heavy. Play with the quantities, you may be able to get many more boards for a few dollars more. EasyEDA ships to most countries. 5 mf68 PCB's are $28.60 plus $17.40 shipping, $46 total to most places. EasyEDA has since lowered their prices. EasyEDA sells electronics parts through LCSC. 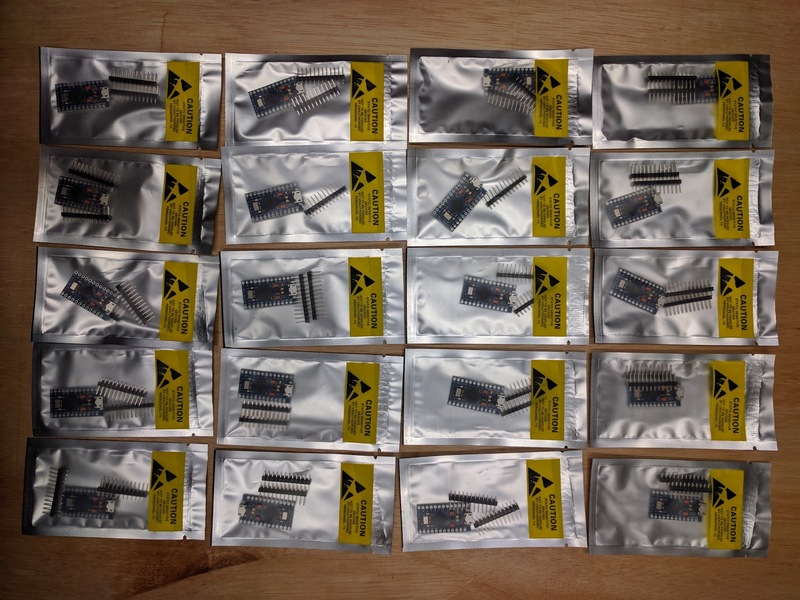 You can get diodes/resistors/other parts shipped with your PCB order. Order PCB from gerber files from di0ib on Vimeo. You do not have to contact me for permission, the license is comprehensive. You can link back to the github page as an attribution. EasyEDA has a new sister PCB company JLCPCB. 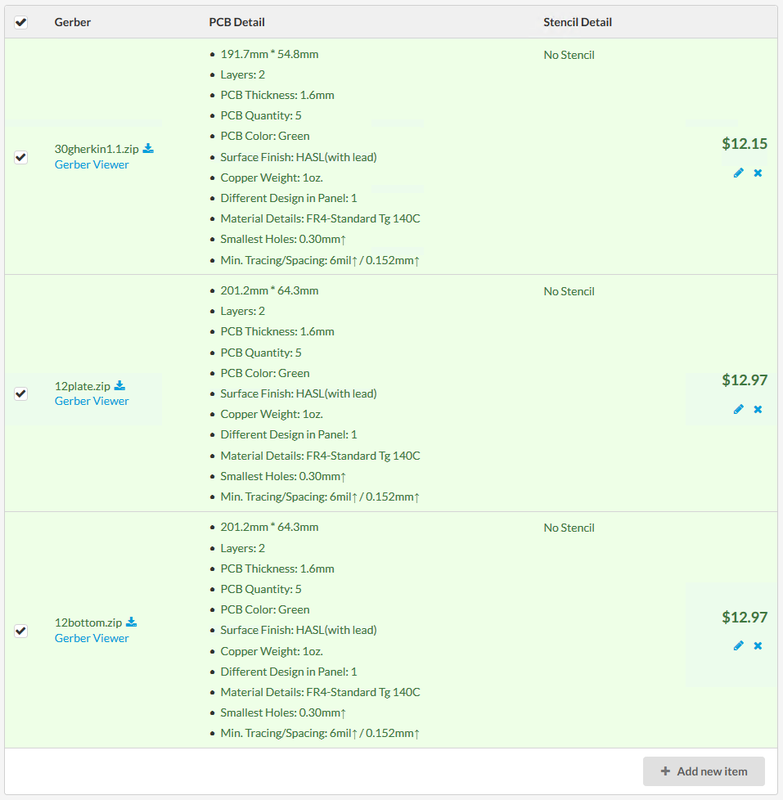 They have different pricing for color PCBs which may make your order cheaper.